A balanced bite is the key to long term success and satisfaction to any dental treatment, from cosmetics and oral reconstruction, periodontal, or implants. Yet it is so often ignored. Without a balanced bite, damage will continue to the oral structures and expensive dental treatment. Teeth will continue to wear, crack and move; implants will fail, porcelain veneers, crown and bridges will break or be rejected, and periodontal disease will progress. Most of you have experienced a dentist adjusting a filling or crown to make it fit into your bite. This is of course necessarily, but limited in scope. Rarely is the entire bite or occlusion balanced in a comprehensive way which takes into consideration all the teeth, the jaw muscles and the jaw joints or TMJ. The "gold standard" for TMJ and bite includes a thorough clinical exam, an MRI and CT scan of the left and right TMJ. Additionally, an occlusal analysis, mounted case may be completed as well. Rarely is this level of diagnosis performed or even discussed by dentists (just ask them). A balanced bite should achieve harmony between the teeth, the jaw muscles and the jaw joints or TMJs. 1) A balanced bite starts with the lower jaw properly seated in the jaw joints or TMJs. With the above bite, the lower jaw is in a bad position in the jaw joint or TMJ. Most people have jaws that are positioned like this. This is unstable, and causes many dental problems such as pain, poor function, damage to the teeth, TMJ, muscles, bone support of the teeth and failure of dental treatment. 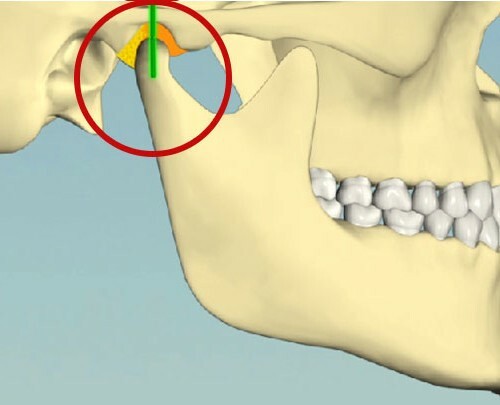 With the above bite, the lower jaw is in a good position of lower jaw in the jaw joint or TMJ. This is stable and conducive to long term health and success of all types of dental treatments. 2) Along with maintaining the proper position of the lower jaw in the jaw joint or TMJ, a balanced bite requires that all the teeth contact evenly when biting to reduce stress. 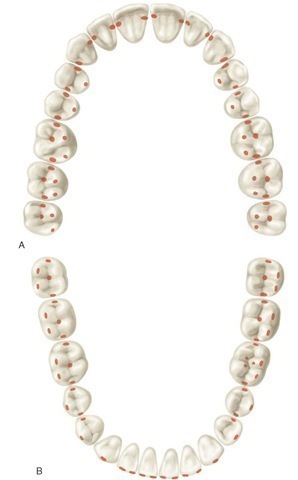 lower teeth first meet (static occlusion). 3) In addition to maintaining balance in a static bite position (above), the teeth need to allow proper jaw function when they slide over each other during movement. Watch the 2 brief videos below to understand this concept.